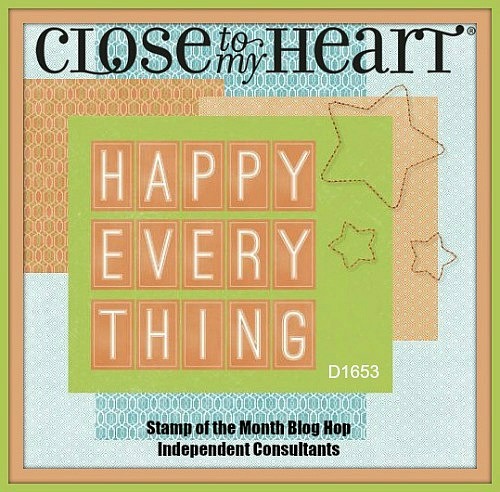 Welcome to the August Stamp of the Month blog hop. 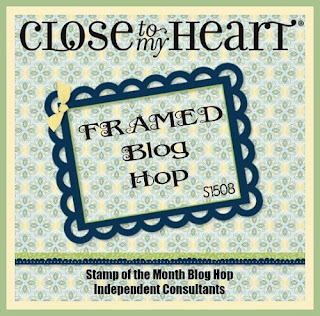 This month we are showcasing "Framed" a set of 12 stamps and have about 50 consultants participating for lots of inspiration! If you are coming from Priscilla's blog, you are on the right track. It's okay if you are starting here; just be sure to complete the circle so you don't miss any of the wonderful projects my fellow consultants have created. This stamp set is going to be one of your favorites with all it's many uses. To get my mind off the heat, I made Christmas candy pack. The little topper was cut with the Artfully Sent cartridge. Colors are Cranberry and Olive. It would make cute little gifts for the kids to give their classmates. Now hop along to Gina's blog to enjoy more great artwork. If you get lost along the way, you can find the full list of bloggers here. Don't forget this set will only be available for the month of August. Contact your consultant or go here to order yours today! 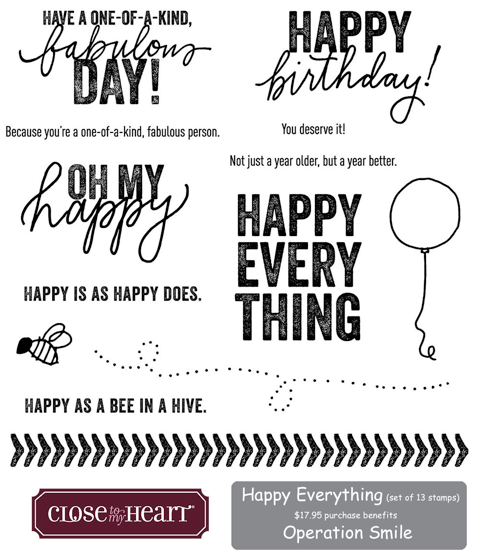 For this hop we are showcasing "Happy Everything" a set of 13 stamps. 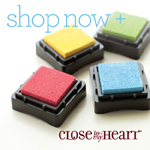 Close to my Heart donates $3.00 from each sale of this set to Operation Smile. We have about 30 consultants participating in this special hop. If you are coming from Jacquelin's blog, you are on the right track. It's okay if you are starting here; just be sure to complete the circle so you don't miss any of the wonderful projects my fellow consultants have created. 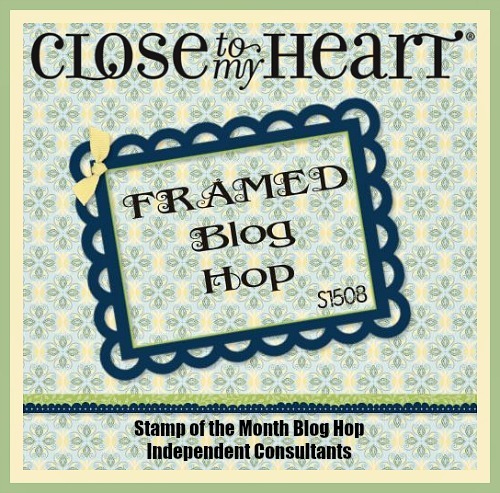 Now hop along to Jeanie's blog to enjoy more great artwork. If you get lost along the way, you can find the full list of bloggers here. Don't forget this set will only be available until the end of August and if you order it through me I will personally match the donation to Operation Smile. Contact your consultant or go here to order yours today! 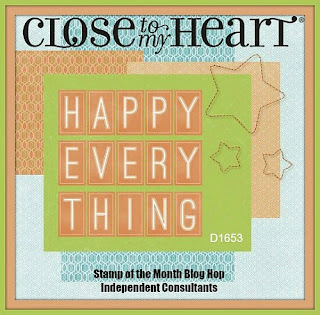 Welcome to the July Stamp of the Month blog hop. 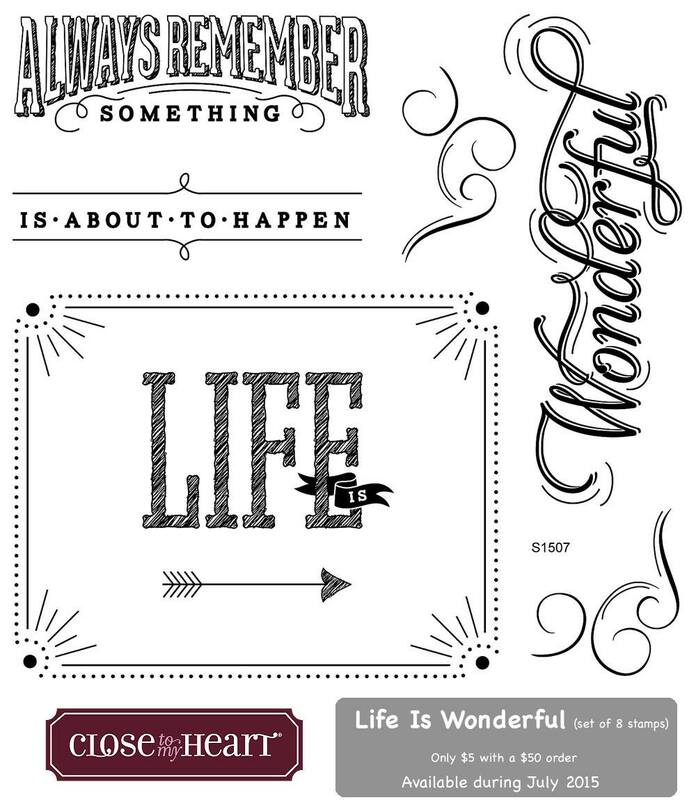 This month we are showcasing "Life is Wonderful" a set of 8 stamps and have about 50 consultants participating for lots of inspiration! If you are coming from Lauren's blog, you are on the right track. It's okay if you are starting here; just be sure to complete the circle so you don't miss any of the wonderful projects my fellow consultants have created. The card I made this month uses B&T paper from the Seaside paper pack. I love the rustic feel of this paper and I think it could be used in so many types of projects. 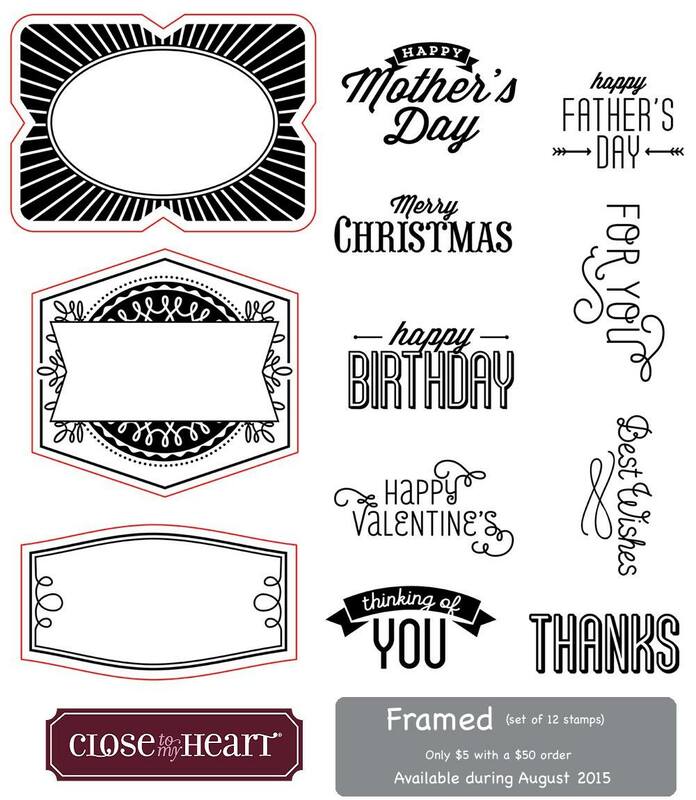 I masked the Always Remember stamp to create the top panel. For the bottom panel I stamped the frame on Colonial White cardstock, rounded and cut slits in the corners, then inserted one of the Jackson "Picture My Life" cards. I finished it off with hemp and Glacier twine. Now hop along to Wendy's blog to enjoy more great artwork. If you get lost along the way, you can find the full list of bloggers here. Don't forget this set will only be available for the month of July. Contact your consultant or go here to order yours today! 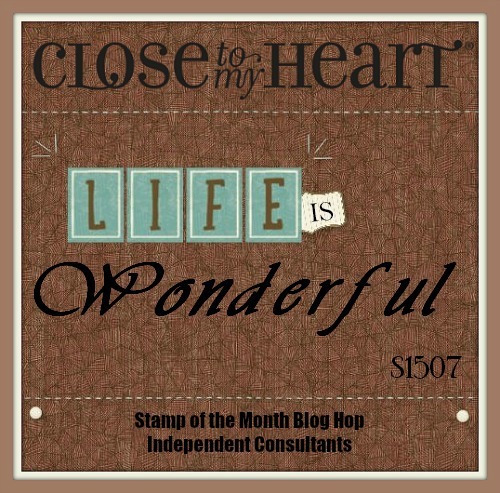 Welcome to the June Stamp of the Month blog hop. 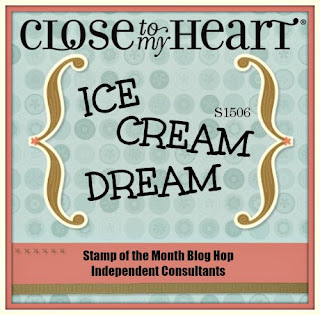 This month we are showcasing "Ice Cream Dream" a set of 7 stamps and have about 50 consultants participating for lots of inspiration! If you are coming from Angela's blog, you are on the right track. It's okay if you are starting here; just be sure to complete the circle so you don't miss any of the wonderful projects my fellow consultants have created. It is almost the end of the school year and a very busy time so I wanted to do a card that didn't require a lot of planning. The size of the card I made is 8 x 3 1/2 inches. 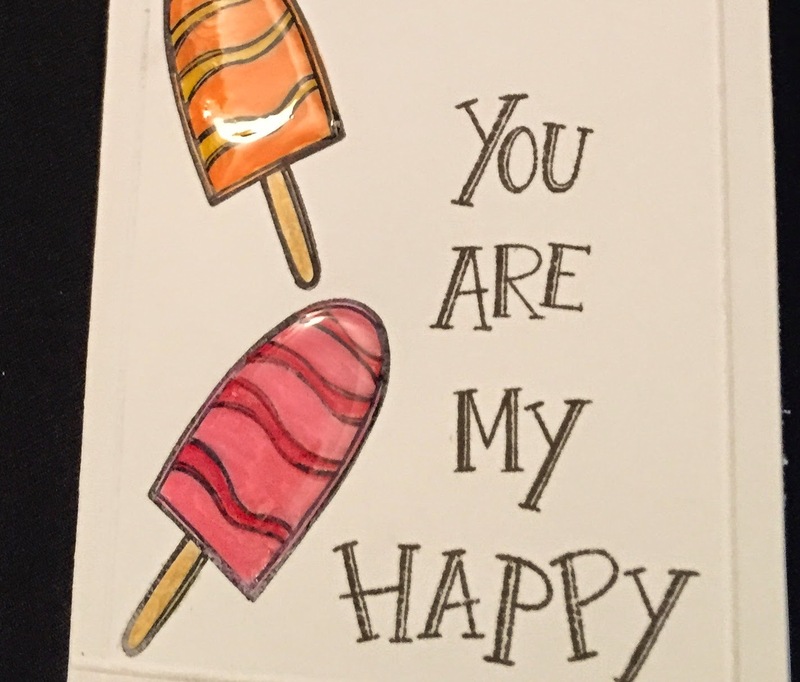 It is a clean and simple card that was quick to make. Since the card base is only a single piece of cardstock, I decided to dress it up a bit by embossing a frame around it. This was done using CTMH's score board. 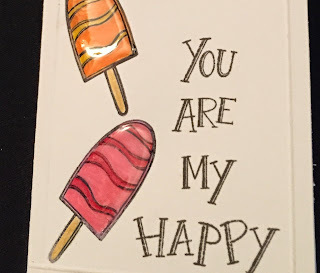 I used colored pencils to color the images rather than markers so that I didn't have to worry about bleed through; and covered each with liquid glass. 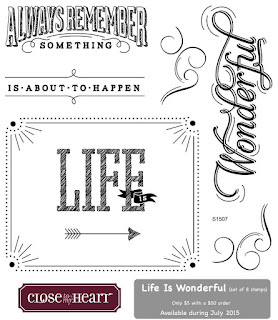 The sentiment on the outside is the stamp from the set which I just masked to use each word separately. Inside I put another stamped image with a bite out just for fun. 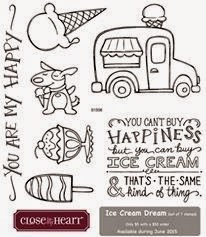 The sentiment was stamped using an alphabet set. 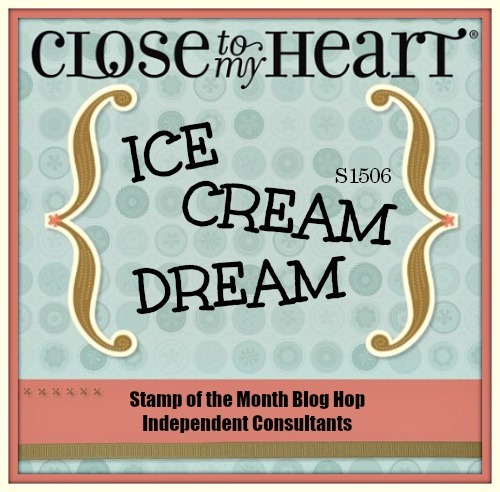 Now hop along to Lori's blog to enjoy more great artwork. If you get lost along the way, you can find the full list of bloggers here. Don't forget this set will only be available for the month of June. Contact your consultant or go here to order yours today! 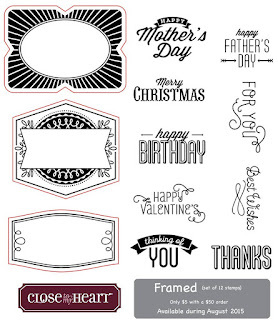 Don't overlook your sewing machine as a tool for scrapbooking. You can utilize a straight stitch, zig-zag, long, or short stitches. Use stitching to outline a journaling box or a photo, or create a punched-hole design on your page with an unthreaded needle.